Take 5-6 eggs and 2-3 potatoes, boil them in a cooker or boiling pot.Usually, in the cooker, it takes 1-2 whistles. Once egg and potato are cold take them out and peel off egg's outer white cover and potato's brown layer. In a pan heat, the oil and fry those cover less eggs and peeled chopped potato separately until it gets golden brown. chop 2-3 onions in big pieces, peel off 5-6 cloves of garlic also take a small piece of ginger and after wash take out the upper cover.Put everything in grinder add cumin seeds,pour a little water in it and start the grinder. Onion Paste is ready. Chop tomatoes and make purry out of it. Heat 3-4 tablespoons oil and add 2-3 bay leafs,big cardamom,nutmeg once they start crackling transfer the onion paste in the oil.Let the paste get cook properly until it turns light brown.You should cook the paste in medium or slow flame as there is chances of getting burnt.Once onion paste is turned brown add tomato purry in it and again let the mixture cook for some time , cook .if required covecook.Once you see the oil has started coming out from the paste put salt as per taste,r ed chili powder(if you like using full red chili then grind with onion paste),turmeric powder,coriander powder and mix them well,add fried potato pieces and cook for 1-2 minutes more. In a separate utensil heat or microwave 2-3 glass water for making curry. Pour warm water in the pan, where onion tomato paste with potato is ready. You have to careful ,while pouring the water as gravy consistency should not be very thin. Once curry water start boiling add chopped coriander leafs .Let them boil and add fried eggs (full eggs or cut in 2 pieces). Cover the egg preparation and cook for 5 minutes more. Serve the egg curry with steamed rice or chapati. 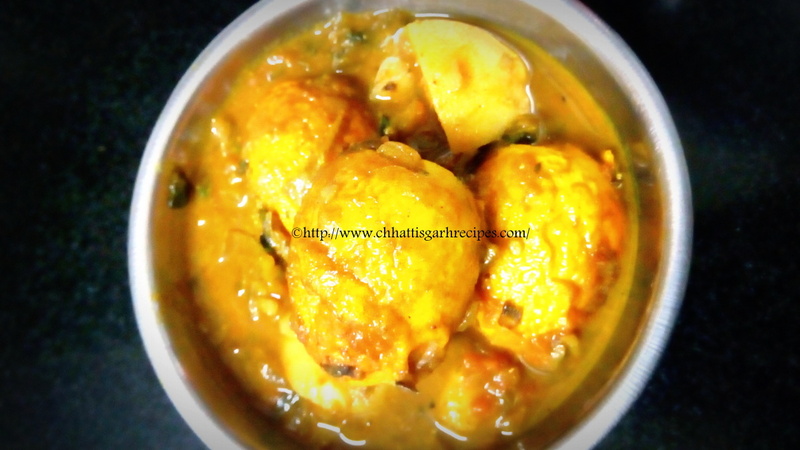 Note : The qualities of egg is known by every one .Egg is highly protein rich .In chhattisgarh recipes egg is eaten with lot of interest . Lotus fruit is commonly known as Pokhara in Chhattisgarh.Pokhara /lotus fruit is eaten and high on nutrients.Lotus is the symbol of holiness in Hindu Culture, and one of the important things used in the worship of god. Almost all part of Lotus is used in making Chhattisgarh cuisine, life stem (http://www.chhattisgarhrecipes.com/2016/06/lotus-stickskamal-kakdidens-curry.html) to fruit. Pokhara is white seeds wrapped with green outer cover and embedded in thick & soft bowl like structure.Pokhara /Lotus Fruits are sweet in taste.